Marine Sgt. John Peck survived an IED during the War on Terror that left him with a traumatic brain injury, amnesia, and cost him his marriage. He survived another three years later, one that left him with three and a half limbs missing. He’s one of only two living people to survive the flesh-eating fungus he contracted in recovery at Walter Reed, one that left him as a quadruple amputee. And that’s only the beginning of his story. What followed was a recovery nothing short of miraculous. With resilience and the help of advocates like actor and philanthropist Gary Sinise, FOX’s Jennifer Griffin, and Bill O’Reilly, John would use a specialized “Action Trackchair” wheelchair and a newly-built SmartHome to get a third lease on life. In 2016, Peck underwent a groundbreaking bilateral arm transplant, receiving two new arms. To date, the surgery has been successful. Today, Peck is a motivational speaker, a philanthropist for veteran and wounded warrior causes, and is pursuing his lifelong dream of becoming a chef with the help of Chef Robert Irvine. 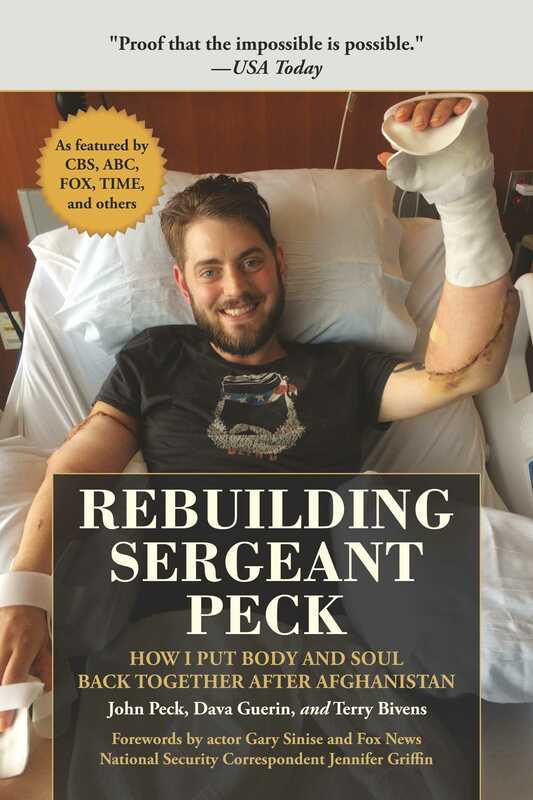 From the lessons learned in a difficult childhood and as a homeless teenager, to dealing with depression in recovery, to learning how to chop with another man’s arms, Rebuilding Sergeant Peck is Peck’s account of an honest, visceral, and inspirational story that is truly unique. “Rebuilding Sergeant Peck is an absolutely riveting, powerful, and inspirational story of a young Marine wounded in combat. Never have I been more moved by the will, strength, or perseverance of a warrior whose actions epitomize the term “combat mindset.” Although it is a great tragedy anytime anyone in the military is wounded or killed defending our country, Sergeant Peck’s story is beyond belief. “The measure of a man is his heart and head. John Peck went through hell to learn—and prove—how true that really is.”—James Carafano, director of the Foreign Policy Studies and Vice President of the Institute for International Studies at The Heritage Foundation.